I’m a precinct captain, elected to Dayton 1-D, but how do I know that? Well, funny you should ask. Unfortunately, the middle name field is required, and I can’t look myself up because I don’t have a middle name. But, my parents who live across the street do have middle names. I can find my father, Stephen G, but when searching for my mother, Nina B, no such person. What’s more interesting is according to the county site, they are in Dayton 1-E. I was elected to Dayton 1-D, and when calling the current director, Jan Kelly she confirmed those assignments. Now, here’s where it gets interesting. 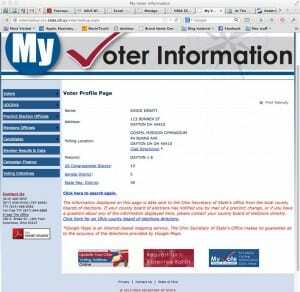 I have a database of all Dayton voters for my campaign- at www.electesrati.com and it has me in 1-D, but I also have a list of the entire county loaded at www.independentdayton.com and that list, downloaded from the Secretary of States site, http://www2.sos.state.oh.us/pls/voter/f?p=111:1 has me in Dayton 1-E and my parents in 1-F.
Stupid question, but isn’t that the core, most essential information maintained by election officials? Shouldn’t something as simple as what precinct you are in be correct? The Secretary of State isn’t told the truth, how can you trust our elections officers? I’d show you mine from the county site, but, alas, I can’t see my registration there because I don’t have a middle name. Quite frankly, this Board of Elections can’t be trusted to maintain their own website in the first place. When I wrote the first post in this series, they still had election dates for 2013 posted and that was on Jan 12, 2014 (since updated). 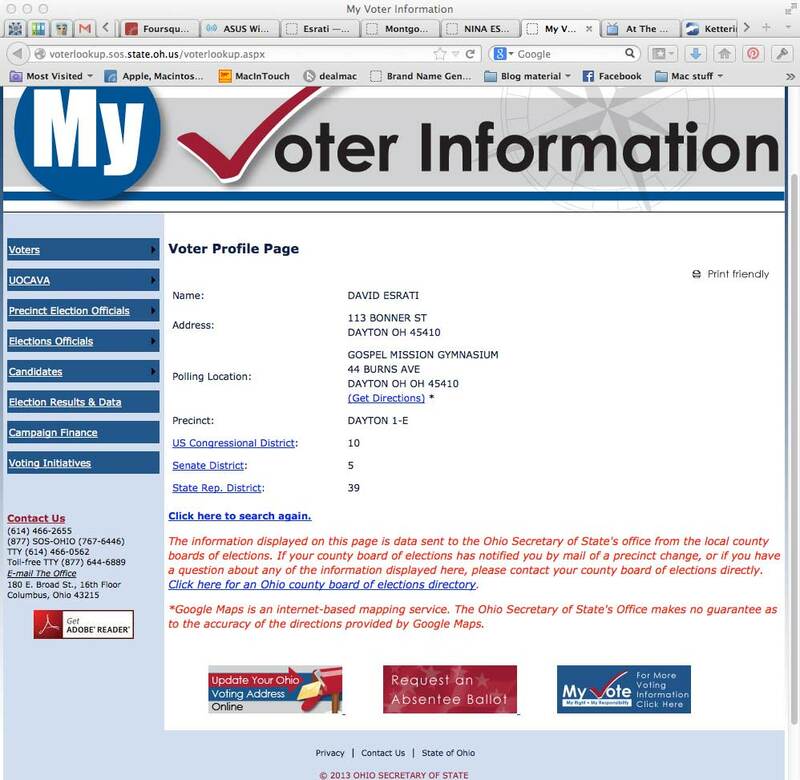 Note, there are no tools for candidates to download the “correct” voter data file from Montgomery County on the county site. With a turn-in deadline of Tuesday for petitions, any questions of voting precinct should be ruled null and void at this point, since the data isn’t verifiable or accurate. An investigation should also be started since this is probably typical of most county board of elections in the State of Ohio- which are run by un-elected political pogues in patronage positions instead of by qualified election professionals. Never mind the fact that in Montgomery County, they are handpicked by the parties- who engage in what amounts to racketeering- filling the lowly precinct captain positions with people who get paid by the politicians they select and elect through illegal closed door “screening committee” meetings. The integrity of election data is, and should be, one of the most sacred duties of any public servant. Unfortunately, in Montgomery County, and by extension now the State of Ohio, we look like our elections are being run by amateurs. There are five different “approved” voter database vendors in the State of Ohio. The question is why? The fact that there are discrepancies between the databases in this instance make one question the integrity of all. There are also difference in field naming, data contained within the fields, lacks of easily sourced data keys (for non-party people trying to utilize this data) and different data maintained by state and local boards. Examples including how election dates are maintained (Montgomery county uses a letter P, S, G and a date 140506 while the State uses the much less cryptic format 05/06/14). The County uses the most arcane, and technically inept way of indicating if someone voted early, absentee or at the polls- using a lower case or capital letter in the election field- something most databases can’t sort on (capitalization) instead of a separate searchable field. I could go on to point out that I still have a real question of how when sending out postcards to people who requested an absentee ballot via mail, or voted early (can’t tell the difference thanks to their data format) I get returns of first class mail to those voters- saying “undeliverable” – yet they vote. There are no investigative reporters left at DDN and none of the Columbus or Cincinnati papers do much in the way of investigating reporting anymore either so exposing this via state media is highly unlikely. An idea that may work: The New York Times loves exposing Midwest corruption–it fulfills their expectations about what they already think. You have done all the investigative work & published in this blog is a formidable document exposing them. Only minimal background copy & fact checking would need to be done—so put it in the hands of a real reporter, one that may hunger for a Pulitzer, w/you as contributor. Take it out of the corrupt county & state. BTW, this is true for a number of your other investigative works published here. TPTB won’t let you qualify as a candidate for an election. Now is the time for them to feel your thunder! Show them what change is all about. So sad but what do you expect from the current or past board members or directors? The bulk of the blame falls on long running director Steve Harsman. The main drive of director Harsman has always been to scam the county out of every dime he can get through obscene salary, overtime, travel and abuse of county time. If he was a competent professional working on serving the taxpayers instead of helping himself to the tax dollar trough these types of problems would not exist. Staff have filled me in on so much disgusting information about the long running director “Hairsman” as they call him it would make your head spin. He should be in jail and unable to collect PERS if the laws of the state were imposed. Say hi to Cathy for me Steve! Free vacations with our tax dollars, I can afford that! Don’t forget the free parking at the county parking garage for the BOE Director and Dep. Director. Wow, all of that salary, the scam vacations and Jan and Steve get free parking right next to the front door of the county garage free? I guess if you are not going to have any shame stealing from the taxpayers you might as well take it all!